We are really excited about a new project we have developed for the Honeywell Community Centre in West Drayton, in collaboration with our partners at A2 Dominion Housing Association. 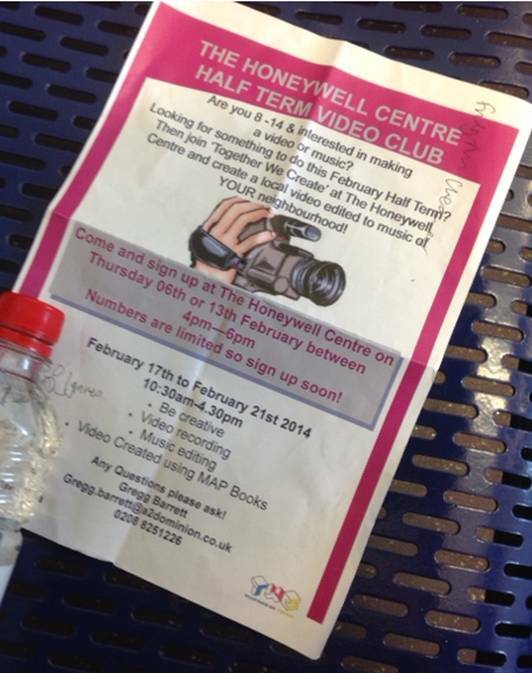 Over February half-term, we will be giving the chance for up to 20 local young people to create a film celebrating the creativity found in their patch of the London Borough of Hillingdon. Working in small groups, the young people (aged 8-14) will get the chance to learn lots of new creative skills to do with film creation and production. Through the week, our team of experts will be on-site to teach the students the core fundamentals involved in creating great films. Team lead, Sarah, will be demonstrating the latest techniques and tricks with camera angles, and exploring the art of great storyboarding, presenting and editing. While professional DJ Tom will be taking time out from the recording studio to coach the students in audio sampling, layering, audio recording and mixing so that they will be able to create their very own sound tracks. Rowan, our tech support and budding film maker, will be heading up the creative part of the programme, and will work with the students to deliver art projects that showcase their creative inspiration. It promises to be a great week! By the end of the week we will have an amazing film; produced, directed, acted and filmed by the students. We promise to share it here first! Creative Minds Wanted – Call for Freelancers 2014 kicks off with a bang! A2Dominion are pleased to be partnering with Together We Create to give young people a fantastic opportunity to create a film about their neighbourhood!